Grace is rarely out of my eyesight, but the few occasions throughout the day that she is (like when I have to go to the bathroom, or put the trash out, or do laundry) it always looks like a disaster has struck in just a minute or two! I've mentioned before that Grace likes to have everything out. For some reason, she likes anything that's in a box or container to be dumped out. Maybe she feels she has to set them free? I don't know. When I ask her she simply says: "sitause" (because). I wish I could say that she only does that with her toys, but sadly, it's with almost anything. Her books, the contents of my purse, the laundry basket filled with clean clothes! In just a matter of seconds she can wreck the place! 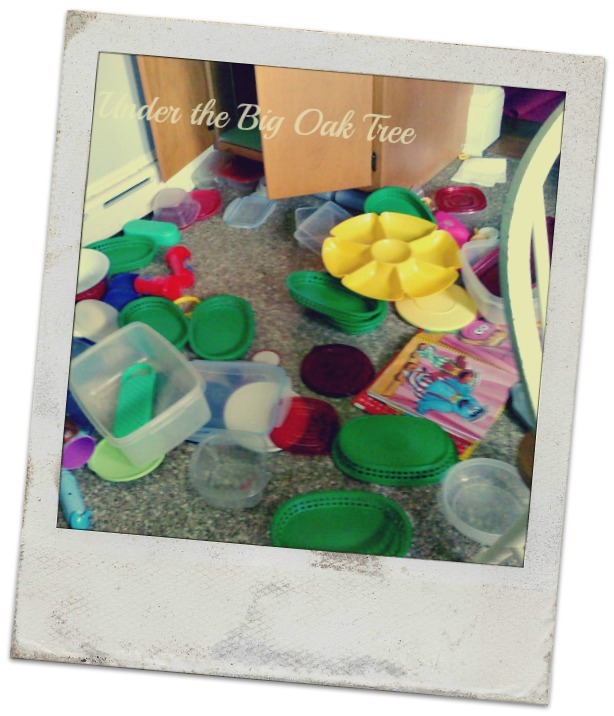 Last week, as we were getting ready to leave the house, Grace made a couple of large messes that really stressed me out! We were waiting for our friends to pick us up to go to a party (more about that in a future post) and I was trying to gather everything we would need for the outing and place it in the driveway. You know, to make things easier for myself. Um, yeah. That plan backfired. You may remember past Wordless Wednesday photos that I shared of Grace emptying my cabinet of plastic storage containers so she could climb in the cabinet herself. Since then, I've moved the plastic containers to a different cabinet in the kitchen, now she just pulls them out for the heck of it. I knew I didn't have time to clean them up before our friends arrived, so I just decided that I would deal with them when we returned home. Powdered sugar. Almost an entire bag. THIS, I had to clean up before we left. 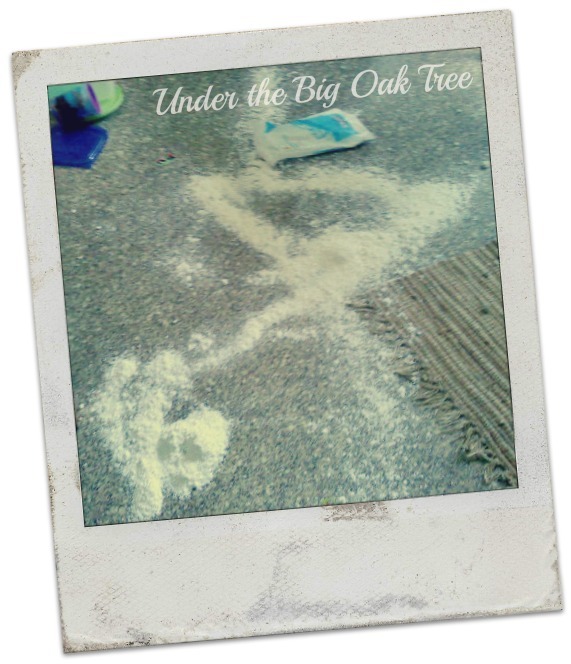 There was no way I could leave sugar all over the kitchen floor! Especially, with the dog home. I don't even know what would happen if she licked all of that up! So, I ran to get the vacuum cleaner and quick picked up as much of it as I could. Just as I unplugged the vacuum, our friends pulled into the driveway! Note: I've been using Photo Bucket lately to edit my photos, but the site was down for the past few days for maintenance. I decided to give picmonkey a try for today's photos. I like photobucket more, probably because I am more familiar with the site, but I think this poloroid option from picmonkey is lots of fun!